You are here: Wooden Troughs etc. 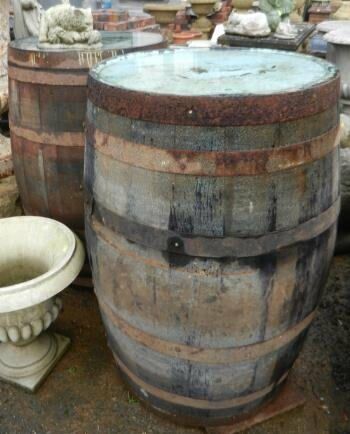 Large oak barrels. Vary slightly in size. Approx. 40 no. in stock. 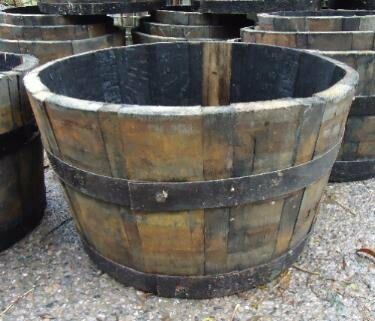 A large oak, wooden barrel planter. A wooden bucket, with a ring on handle if you wanted to hang i from somethingt. These can be used for many different purposes eg. a small log basket, waste bins, or for newspapers or magazines. 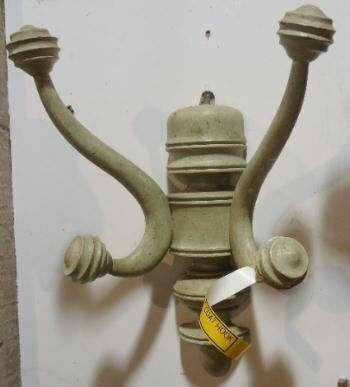 A French reclaimed wooden, painted, double coat hook. 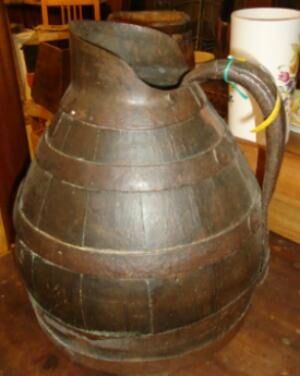 An old French wooden, wine ewer, . 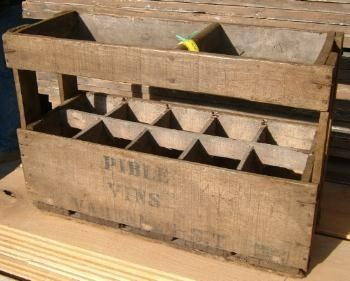 A French reclaimed wine bottle carrier. 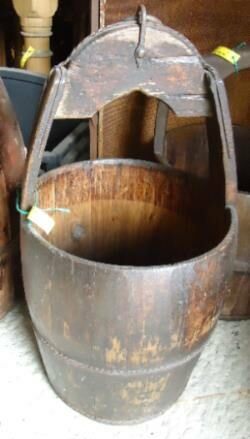 An old French wooden trug, with a leather handle. A set of reclaimed, French coat hooks. 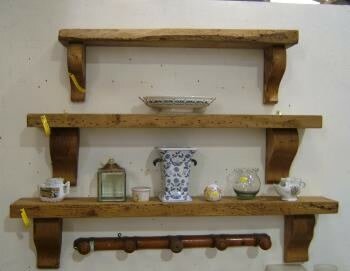 A selection of three different sized over mantle shelves, with corbles, all made from Reclaimed Elm. A reclaimed, set of French coat hooks and a hat shelf. 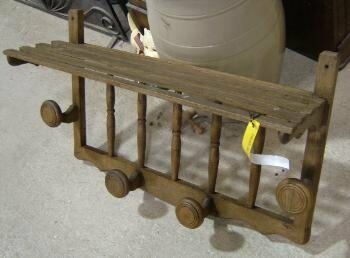 An old large French grape carrier, wth handle. Would make a very good log basket. £195.00 including VAT @ 20%. 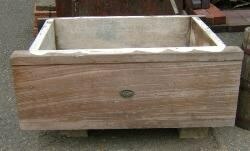 Description : An old reclaimed wooden "Trug"
Description: An old reclaimed wooden "Trug". Could be used as a planter. Description: A small wooden candle box. 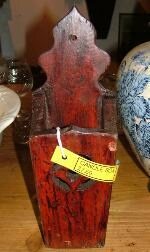 Description: A reclaimed wooden yoke. Description: A wooden bucket with metal handle. Size: 305mm (12") high plus the handle × 330mm (13") diameter. 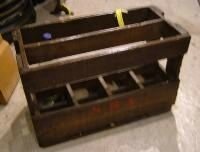 An old French, Wooden baguette box, with top lift up lid. 850mm (33.5") high × 230mm (9") wide x 180mm (7") deep. Price: £ SOLD including VAT. 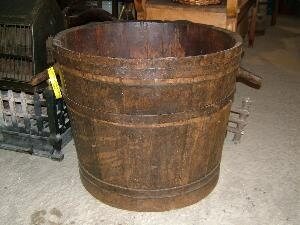 A square tapered, wooden bucket with handles. 330mm (13") high × 385mm (15¼") square. 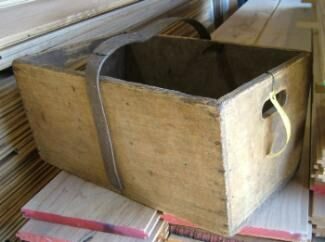 Description: A square wooden bucket. These can be used for many different purposes eg. for storing newspapers or magazines. We have several in stock at the present time, which are all slightly different. Size of one showing in the picture: 215mm (8.5") high : plus handle 405mm (16") overall height × 350mm (13.75") square. 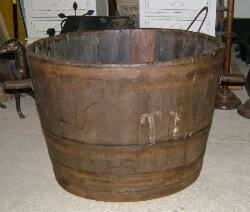 Description: An old wooden grape/apple basket/bucket with handles. (Ideal as a small log basket). Size: 360mm (14") high × 450mm (17¼") diameter. Description: A wooden bucket. These can be used for many different purposes eg. a small log basket, waste bins, or for newspapers or magazines. Size of one showing in the picture: 320mm (12½") high plus handle 550mm (20") overall height × 330mm (13") diameter. 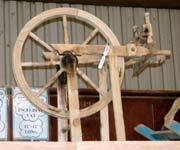 Description: An old wooden spinning wheel : probably 19C. 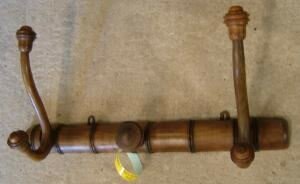 Description: An set of Antique blacksmith's bellows. Made from wood and leather. Size: 1690mm (69½") high × 760mm (30") wide. Description: An oiled & waxed wooden bowl. This is one of several which we have in stock at the present time.